What should we call ‘Grammar Nazis’? For some people the answer is in the question. Certainly Grammar Nazi is a popular and catchy phrase for referring to people who decry errors of grammar – or what they think are errors, or grammar – and who correct other people’s language unsolicited. This looser, more general sense of nazi is well established in informal English. I’m not trying to outlaw it – that would make me a ‘nazi’ nazi. But personally I don’t like the term unless it’s used with heavy irony, because it cheapens and trivialises the horrific historical events that it blithely hijacks for rhetorical effect. Whatever about using Nazi hyperbolically in political contexts to refer to a non-actual-Nazi behaving in a way that may be construed as fascist, I can’t quite get my head around its casual use to refer to attitudes to language use. 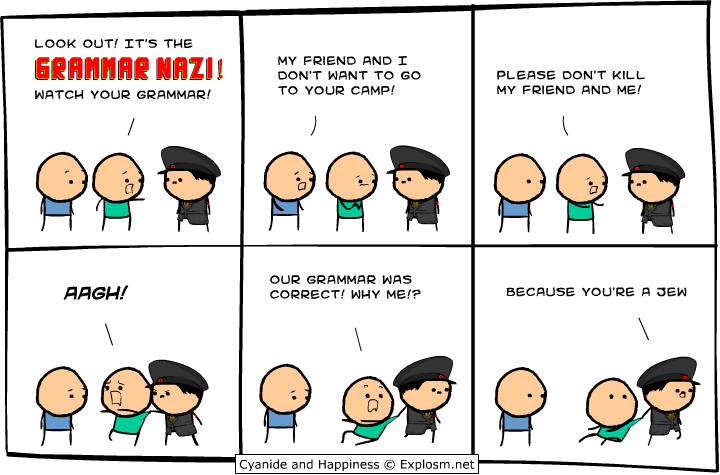 It has become conventional to the point where many people self-identify, even proudly, as a ‘grammar Nazi’.